KUALA LUMPUR, MALAYSIA / ACCESSWIRE / December 24, 2018 / OffGamers announced today that NetDragon will be adding the Multi Game Card as a new payment option for their game titles. Commonly referred to as MGC, the Multi Game Card was created and is managed solely by OffGamers, and it exists as a payment option for gamers to make in-game purchases. 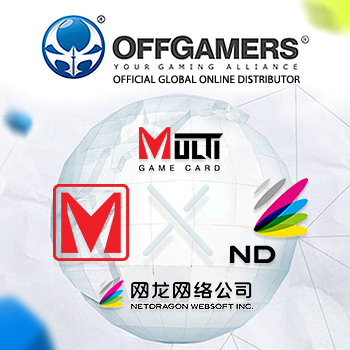 To check out the Multi Game Card options that are now available, please visit www.offgamers.com/search/index.htm?keyword=Multi+Game+Card. As part of their expansion of global payment options, NetDragon will include its game titles as part of MGC’s list of supported games, which gives access to players to use MGC as a means to make in-game purchases. MGC will also increase NetDragon’s global reach through its numerous distribution channel coverage and acts as an offline option where players can buy physical top-up cards from selected stores. “We believe in providing a seamless gaming experience to our players worldwide, and OffGamers’ MGC is up to the task in order to accomplish our goal,” said Condy Chen, Marketing Director of NetDragon. NetDragon, known for developing MMORPGs, is a leading game developer company in China with a multitude of national awards. NetDragon has an array of famous game titles such as Conquer Online and Eudemons Online which host players from around the world. “We’re excited to bring MGC to NetDragon. Their players are going to love what we have to offer in terms of value, convenience, and unparalleled service,” said Karyn Thng, Business Director of OffGamers. Developed by OffGamers, MGC is a payment method established as a solution for offline cash-paying customers. It also serves as a platform for South East Asian game publishers to tap into the global market, allowing them to extend their reach to global players as well as providing a platform solution that guarantees privacy protection and dependability. NetDragon is a company that develops and operates massively multiplayer online games such as Conquer Online and Eudemons Online, to name a few, in addition to making mobile applications. As one of China’s prominent companies, NetDragon is actively pushing forward into the global market to make a significant impact. With 14 years of industry experience, OffGamers is one of the pioneers amongst the global MMORPG distribution service providers. OffGamers have pushed forward to create platforms for local and regional game publishers to be able to reach the global market. With numerous game developers and publishers as partners, OffGamers strive to provide dependable and flexible services for their partners and gamers around the world. MGC came into the scene as a payment option for customers who primarily make cash-based payments. With the addition of more games over the years, MGC also functions as a platform that help game developers and publishers to extend their global reach through MGCs online and offline distribution channels. For more information, please visit www.multigamecard.com/. Thinking about buying stock in Aurora Cannabis, Cronos Group, Lyft, Reebonz Holding Ltd., or Exxon Mobil?